The markets at Roma are on a huge scale. 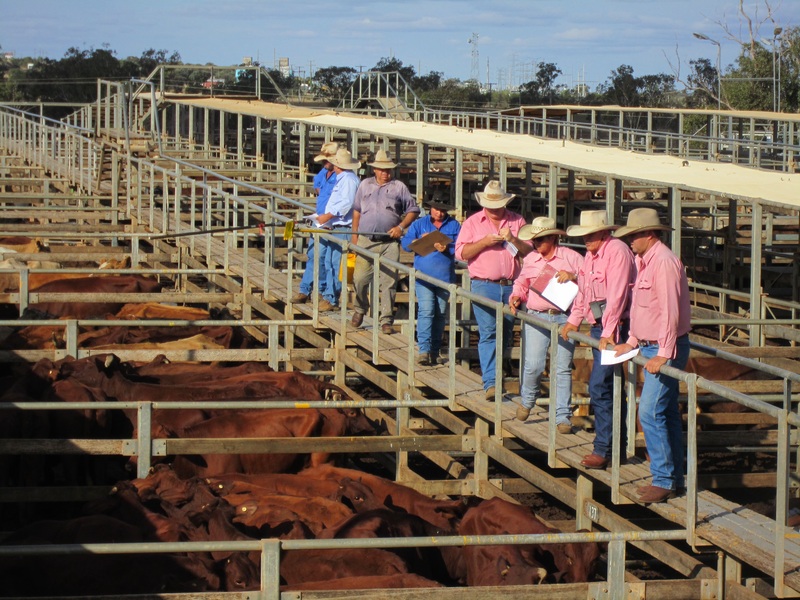 About a million cattle pass through the sale yards and spelling pens each year. Today more than 8000 cattle will be sold. I walk along the metal gantry above the yards where the cattle are penned. Angular steel pens stretch out into the distance. The smell of manure is sharp and sour. The calls of the cattle blare out. Their mix of tone and pitch like a ragged brass band tuning up before a gig. The proceedings are carefully orchestrated for speed and efficiency. Sale yard officials are colour coded. 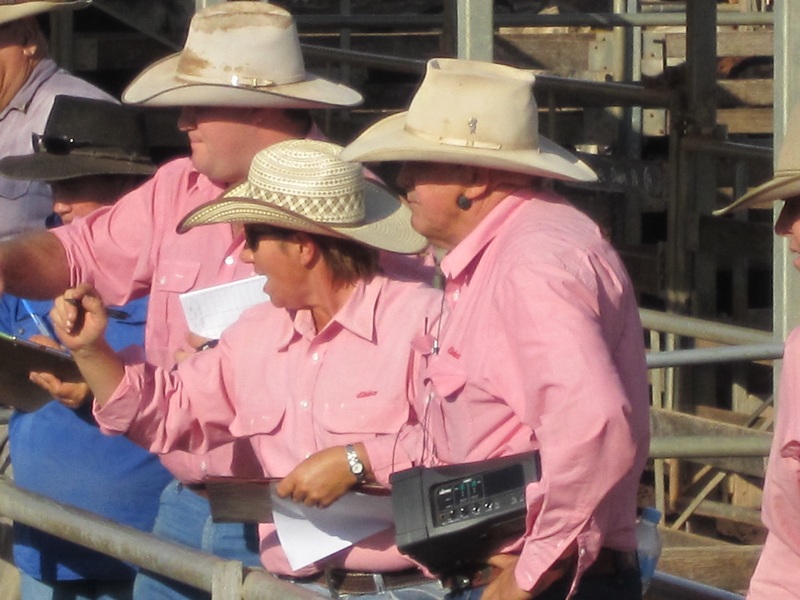 Pink shirts are auctioneers. Spot them and you know where the action is. They jabber and gesture in an arcane ritual as unintelligible to the uninitiated as a witch doctor’s chant. As they move through the yards, a team of four, they conduct the movements in this agricultural dance. Blue shirts are yard hands, both men and women, driving the animals through the yards by waving old grain sacks on poly pipes. They stand on the overhead gantries above the cattle, waiting for the metal gates to open by remote control like lock gates letting the flow of animals through the system. Buyers wear a mix of pastel coloured shirts, some checked some plain. They gather at ground level, moving from pen to pen to assess the quality of the stock for sale. An almost imperceptible nod or wink can buy a pen of thirty steers. To the untrained eye the buyers’ faces look impassive, their movements slow and cautious. A counterpoint to the frenzied pink shirted auctioneers. Everyone wears a white akubra hat. A yard hand named Fish stands and chats as we watch the sea of cattle move below us. 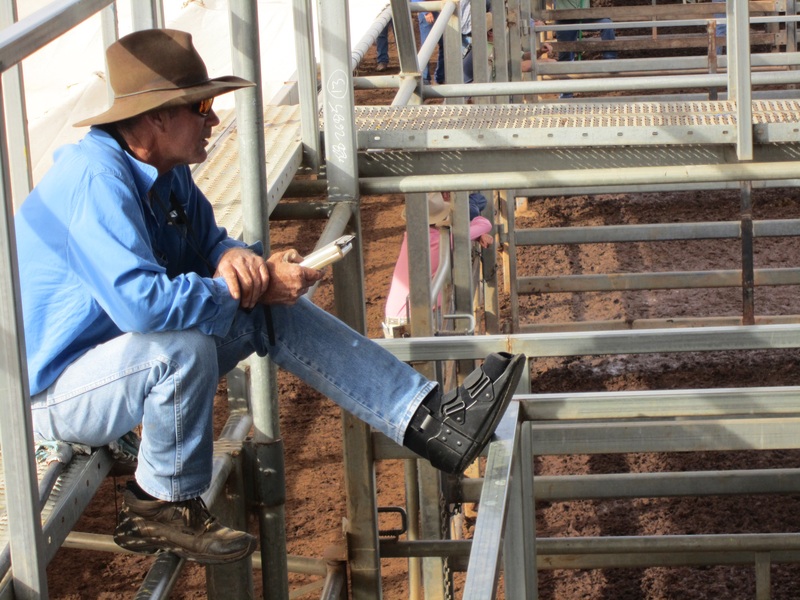 He’s worked at the sale yards for 35 years, starting when he was fifteen. They talked about selling them off a few years ago and there was an outcry, he says. They stay in the Shire’s hands, for now. Its hard work but he loves it. Every market day the auctions run from 8am until 8pm. 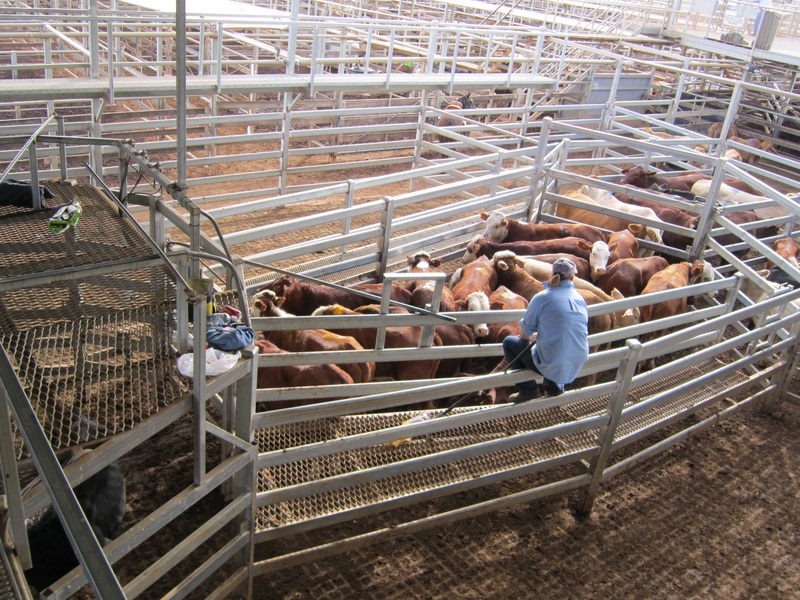 There are private sales using the yards and a significant business spelling cattle in the yards. There is always work to do and he knows the ways of the sale yards well. It’s a good life. 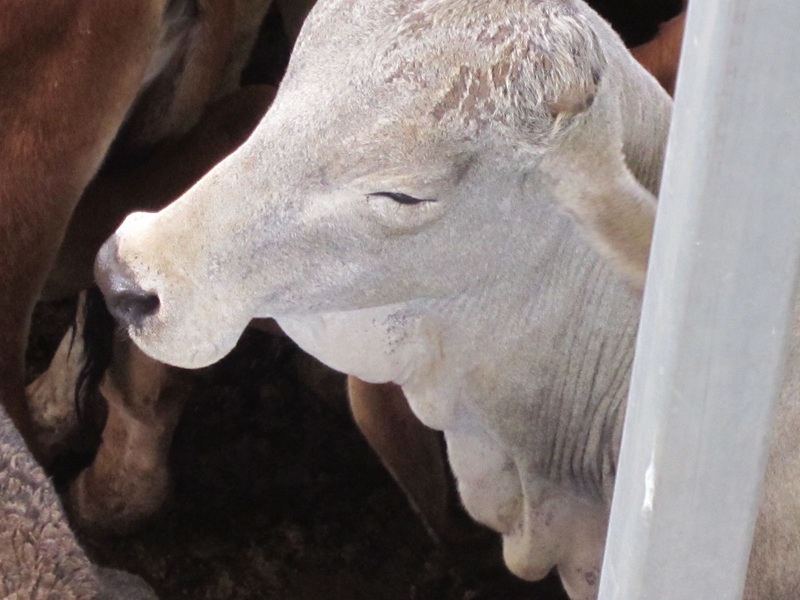 This entry was posted in Australia, On the road, Outback, queensland, roma, travel and tagged Australia, beef, cattle, farming, Outback, queensland, roma, sales, Travel on 29/05/2015 by Deb McSephney. I don’t know which is worse–being forced into catch-pens like that, or being forced to wear a pink shirt. I’d go for the pink shirt any day.